EMILY SERSHON: Hey Andrew! You wrote ACME! Tell us a little bit about yourself. ANDREW SHANKS: Hey-O! I’m a writer and performer working here in Seattle. As a writer, you may have seen my work at Bumbershoot, Spin the Bottle, Pocket Theater, or more recently at Panel Jumper Live: Chapter IV. As an actor, I’ve recently had the great pleasure to work with Theater Schmeater, Sound Theatre Company, and Forward Flux Productions. You can also see me in the local webseries Northern Belles. ES: And you’re our Company Manager! AS: Yes I am! Viva Annex! ES: Annex the world! What prompted you to write ACME? How is ACME similar to your other writing? Different? AS: ACME has been percolating under the surface for a while. Elements came together over the years whether it was a writing exercise or a one-off performance (usually involving my overall fascination with nefarious organizations and a certain cartoon coyote). The real spark came when I started working for a tech service company a couple years ago. It was the perfect setting for a large ensemble-based satire about the inner workings of the tech industry. ACME is definitely the most ambitious show I’ve ever written. ES: Well, it’s a big cast! Just knowing it’s a corporate tech-industry satire, I cannot wait to see the characters. What kinds of people do we meet inside ACME? Is there one specifically that you identify with? AS: ACME’s got a little bit of everything! An eccentric CEO, an omnipresent H.R. representative, security guards with strange dietary habits, tech-bros, scientists in fear of being terminated at a moment’s notice, a gonzo journalist with a score to settle, and an intern with hidden connections to ACME’s sordid past. There’re plenty more cogs in the machine but what I love most about these characters is that, while they live in this ominous sinister world, they all seem pretty naive about it. It’s kind of like that one henchman in the Bond movies who questions whether he works for the bad guy or not: Dude, you work in a lair carved out of a volcano, what do you think? AS: As far as identifying with one character specifically — definitely Jules, our intern in the show, wonderfully played by Nabilah Ahmed. I think we can all identify with feeling overwhelmed by situations we’re thrust into unexpectedly while still trying to keep a level head about it — except at ACME, you might literally lose your head. You have got to read those Terms and Conditions, people! I will say that director Mary Hubert has assembled one hell of a cast here. I’m in awe of how much commitment they have for creating this weird weird world. ES: Yeah, I’m really enjoying seeing the cast and the science-gone-amok unfolding on Instagram. Can I just say your design team is killing it? AS: Seriously. I’m in awe. You will believe that portals to another dimension exist. ES: Apart from your experience in the tech industry, what are the artistic influences for ACME? It’s got a pretty unique aesthetic, hasn’t it? AS: I tend to wear my influences on my sleeve at times; I’m sure you’ll be able to spot a few as you watch the show. The goal was always to create two very different worlds and smash them together. What happens when one bleeds into the other? I’d say what those worlds are but, much like company itself, there’s a lot of mystery in ACME. I like setting up these little puzzle boxes for audience members to get lost in. If they’re in for the journey, I think ACME will take them to unique places to get answers. ES: So mysterious! I guess people will just have to come see it. Is there anything else you want folks to know before they come? AS: Basically this show is an adaptation of “If You Give A Mouse A Cookie” but instead of a cookie it’s a ray-gun. ES: Haha, awesome! Thanks Andrew. I can’t wait. EMILY SERSHON: Hi Mary! Tell us a little bit about yourself. MARY HUBERT: Hi there! I’m a freelance director and producer who has worked with multiple companies throughout Seattle. You might have seen some of my work with The Horse in Motion, and I also recently directed Girl at Annex. I’ve typically worked on ensemble-driven devised adventures, so I’m really excited to branch into the delightfully comedic, scripted world of ACME! ES: What drew you to ACME? Have you and [playwright] Andrew worked together before? MH: I was initially drawn to ACME for a variety of reasons. As an artist who deals frequently with the corporate tech world, I was interested in the ways that Andrew highlighted the culture of upgrades and obsolescence that we see in modern America. I also was fascinated by the idea of creating two very distinct worlds: that of ACME and the cartoon world. Physicalizing animation onstage is an exciting challenge for a director! Andrew and I have worked together before, so I know his writing style and already have a great relationship with him as a writer. Recently, we produced a short play of Andrew’s called W O L F at The Pocket Theater. ES: So we have the corporate world of ACME, and a cartoon world… Is ACME a comedy? I understand there’s a mysterious sinister side of the script. MH: Yes! ACME is definitely a comedy. It is a corporate satire, with a hefty dose of mystery and sinister goings-on. One of the things that Andrew does very well is create a chaotic, comprehensive, madly entertaining environment that still manages to hold a candle to some issues pertinent to our lives as modern-day Americans. And we get plenty of weird science-gone-amok to boot! ES: That sounds like a jam-packed show! What’s one of the biggest challenges you’ve faced so far? MH: All of the amazing magic that happens in the show! We have multiple cartoon characters onstage, eight different locations (some of them entirely made up) wacky ACME products, and a Void into another dimension!! This calls for plenty of inventive designs and solutions, and my design team and I have definitely been kept on our toes making the madness of ACME come to life! I’m incredibly impressed by my design team, and I’m really excited to share what we’ve come up with. I think that we can all relate to this idea with the many tech products we use. But, more than that, ACME takes this concept one step further, applying it to the obsolescence of people themselves. ES: I love that you’ve made Void a proper noun. I can’t wait to see that on stage! Obviously there’s a lot of theatre magic to look forward to. What do you think audiences will relate to from their everyday lives? I’ve heard you mention the culture of obsolescence. MH: ACME explores the idea that our products are built to fail, that they are made to only last so long so that we continue to buy the latest “upgrade”. I think that we can all relate to this idea with the many tech products we use. But, more than that, ACME takes this concept one step further, applying it to the obsolescence of people themselves. The workers at ACME constantly face threats of upgrade and termination. Avery, the head of the company, is obsessed with finding the “next big thing”. As we become increasingly fixated on being the best versions of ourselves, and as we all compete for an increasingly shrinking, cutthroat job pool, I think that this portrayal of the disposability of the ACME workers themselves will ring true to many. ES: Yikes. Yeah, I can definitely relate to that. Is there anything else you want people to know about ACME before they come see it? MH: It’s a crazy wild ride, so buckle up and get ready for the madness!! ES: Awesome. Thank you Mary! MH: Thank you so much! Chaos, comedy, and cake collide in Eat Cake, the Queer wedding of the century. Ariel and Addison are throwing their dream wedding, a DIY extravaganza, but the clock is ticking and everything is a disaster. The guests won’t stop screaming at each other or running into backrooms to make out, the cake is a catastrophe of colossal proportions, and an un-invited guest shows up stoned. What’s worse, is the couple even into the whole “gay marriage” thing or are they just doing it for their family? Featuring a diverse and colorful cast, Eat Cake is a riotous modern comedy that asks whether the love of two misfits can triumph in the face of familial calamity, and the sacrifices they have to make along the way. Instead of expressing his terrifying vision of malevolent, eldritch gods via horror stories in the early twentieth century, H.P. 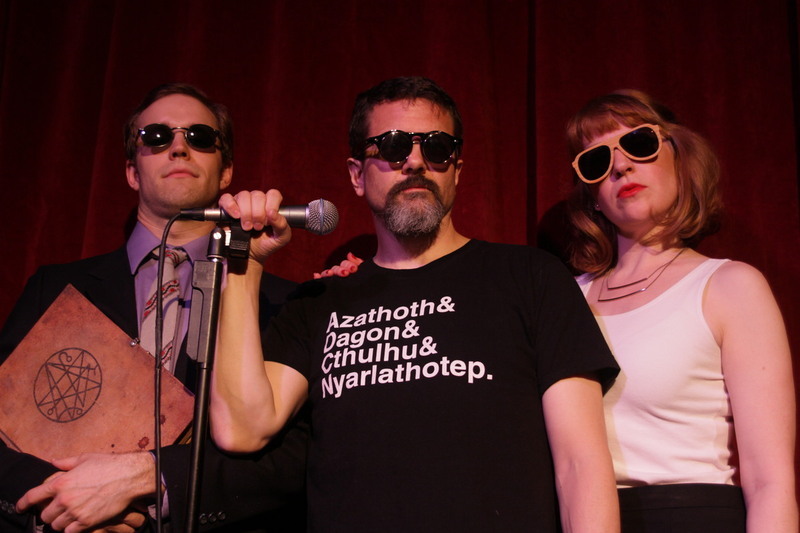 (“Howie” to his friends) Lovecraft expresses his terrifying vision in the present day via stand-up comedy. But an ancient evil stirs beneath the sea— can Howie pull off one last sold-out gig before the human race is destroyed?